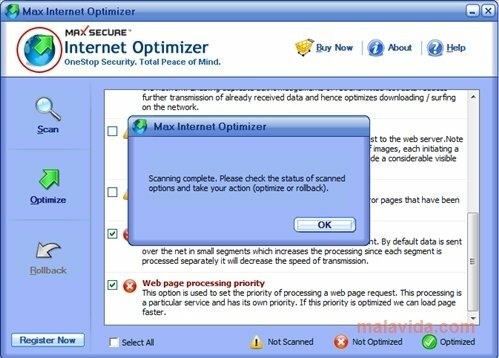 The vast majority of users don't know how to configure their computers to make a more effective use of their Internet connection, wasting in many cases the potential of the service that companies offer. 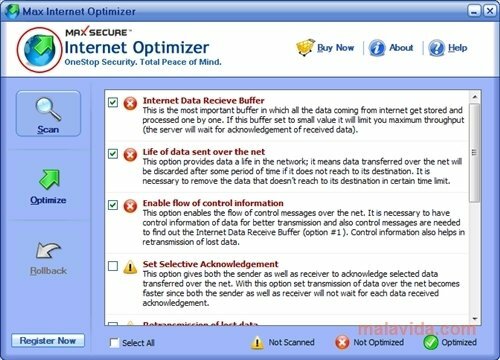 Max Internet Optimizer can help us to improve our connection, by simply modifying certain parameters of our computer's configuration, managing to remarkably improve the speed with which we browse and download from the Internet. The program completely analyzes our connection, presenting a report about the options that can be modified to benefit us (transmission priorities, buffers, ports,...). Once analyzed, Max Internet Optimizer will give us the option to change the configuration of all the parameters with a single click, allowing us to go back to the original state of the Internet options on our computer, in case any kind of problem arises. Don't think twice and start to make the most of your connection speed from this precise moment thanks to Max Internet Optimizer. The trial version analyzes our connection and offers us information, but doesn't allow us to change the settings.